Beauty Crave: Sephora Friends and Family Discount! Hey Loves! I hope you all have had a great day. Here is another installment of Beauty Crave. All of these items I mention are from Sephora and I am sure that you all know that Sephora is doing its famous friends and family discount sale of 20% off. Just enter code FF2009 at checkout, and this offer is good from Octpber 19 2009 until November 2, 2009. This offer is only good for online shopping, so get to filling up those shopping carts and start shoppin' chicas! If any of you ordered any Sephora goodies, I wanna know what you got! Share in the comments. How adorbs is this Bare Escentuals eye set? This totally screams Holidays to me! I can definitely see this trio of gorgeous eye shadows looking great all through fall and the coming winter months. And they would make the cutest gifts! 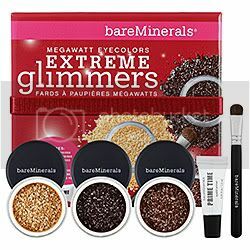 This set includes 3 shimmery loose eye shadows in Extreme Pyrite, Extreme Malachite, and Extreme Perlite. It also includes a mini-Prime time eyelid primer and a mini Extreme Glimmer eye brush. I say this is a pretty good deal for $32.00. Yes, Urban Decay has done it again! They have added nail polish to their line ( I think they had nail polishes before, and they are bringing back out again with this set. I am not sure. Correct me if I am wrong please) and these babies are screaming my name. 7 nail polishes for $26.00? That sweetens the pot even more. Look at all the pretty colors too. I am really loving Grunge (metallic peacock). I bet it would look fab! Yum! I love Egg Nog for the holidays. I bet this amazing 3 in 1 from Philosophy smells just like it, making sure to bring back sweet holiday memories. What a smart idea this is...but it is nothing we haven't heard before. This is the first time I see a company come out with a shadow shield though. I bet it would be great at preventing raccoon eyes. How many of us have had that problem? (raises hand!) 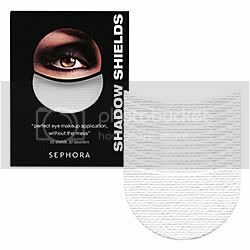 This shield prevents eye shadow fallout, and it is hands-free. We can all use a little help in the teeth-whitening department these days. And what better way to handle the problem with something portable that can be taken everywhere with you! 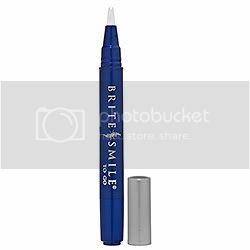 It is a brush tip pen that (according to the Sephora website) whitens teeth up to 8 shades! Whoa...I gotta see it to believe it. It sounds too good to be true. But you will never know until you try it, and the customer reviews at Sephora.com are pretty good for this product-it got over 4 stars! This teeth whitening pen is formulated without harsh ingredients that may be harmful to your teeth such as parabens, no synthetic dyes, sulfates, petrochemicals, and many other ingredients we ain't cool with. Have any of you tried any of the products I mentioned above or, are planning on trying them out? Let me know in the comments section loves! disclosure: I am not advertising these products, or have ever tried these products. I am not affiliated with Sephora. I am just trying to give my readers ideas on what products would be fun to try and check out next time they are at Sephora. I'll probably post my haul today, since I'll get the package. If not.. then I'll be posting it tomorrow. No, I have not tried that teeth whitening pen out. But I am looking forward to it. I am going to try and get my hands on it ASAP!!! !